There's nothing we can recommend more than travelling around South Africa with your own means of transport. This is a country jam-packed with exciting and beautiful things to see and do, many of which are away from the usual bus routes. Having a car to travel around South Africa not only gives you the freedom to see various sites, but you can pack up and leave your hotel when you want to — no schedules! 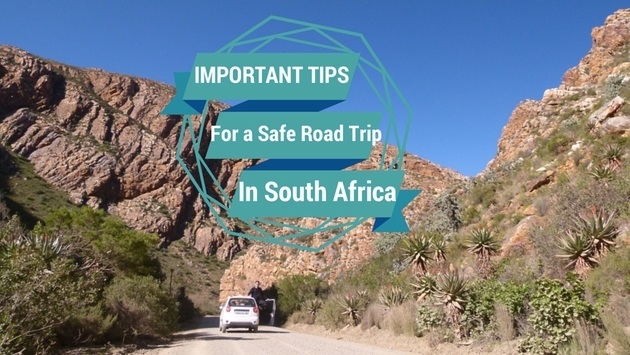 Even though having a vehicle is an amazing way to see the country, there are some important things you should know in order to stay safe on the road in South Africa. In most parts of the world, driving at night is OK, but not in South Africa. There are potholes here the size of canyons that you definitely won't see in the dark. People and livestock roam the roads, both of which are very hard to see at night. But the main reason to make sure you arrive at your destination before the sun has set is for safety reasons. To lower the number of carjackings, there are laws in place that say you can drive straight through red lights and stop signs at night! Arrive at your hotel before dark and you'll be just fine. Glad we didn't have to change a flat tire at night! You'll notice that there are men wearing bright coloured vests in the parking lots of grocery stores, malls and restaurants. He'll often say "watch your car?" To which you should always reply "yes". For around fifty cents, he'll keep an eye on your vehicle to make sure no one breaks into it. He may even top up the meter for you if you're running low! Sometimes these guys will wash your car as well if you ask, for a fee of course. It's wise to pay the man in a neon jacket; you don't want anyone messing with your car. 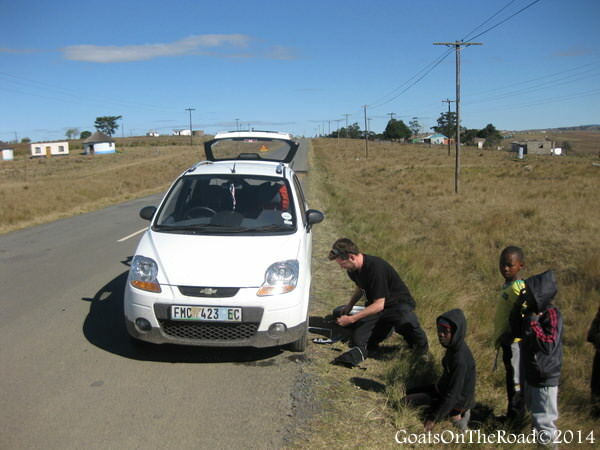 You may be tempted to pull over and assist the helpless woman on the side of the road with a flat tire, but in South Africa, just keep driving! There are scams targeted at drivers, and once you pull over to help her out, her partners in crime will jump out of the bushes and try to rob you, or steal your car. Stop for no one. Although it's great to drive along the coast and the highway with the windows down and the breeze blowing on your face, make sure to roll the windows up when you reach a town. If you're sitting at a red light, or parked in a parking lot with your windows down, you'll be an easy target for someone to reach in and steal your belongings. Enjoy the breeze outside of the cities, but turn on the air conditioning and roll up the windows when you reach town. Our little Chevy Spark car for five weeks. There are many obvious reasons to have a good map, but the reason we're suggesting you have one is that there are lots of scenic drives in South Africa. Not only will a map stop you from getting lost, but they typically list various routes you can take to get to your destination. We suggest always opting for the "scenic routes" listed on the map, as those drives are stunning. Having a cell phone is just plain smart. Use it to reserve hotel rooms, to call someone if you need a tow truck, or if you're lost. You can buy a local SIM card when you get to the country. 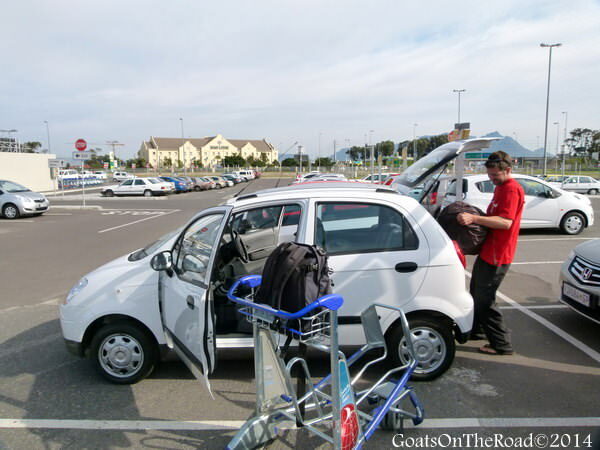 Even though this may make road-tripping through South Africa sound somewhat dangerous, we rented a car and drove around for five weeks and not once did we feel unsafe. We had one flat tire and that was it. If you follow the simple advice above, you'll have a safe and memorable time in South Africa.